Hello friends and welcome to Newton's Nook Designs November Release Day 2! 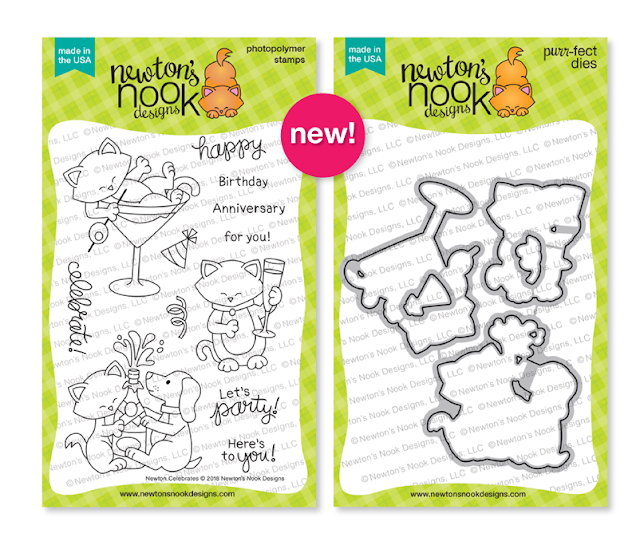 Today we have 2 beautiful new stamp sets to share with you. They are perfect for the upcoming holiday and winter season. 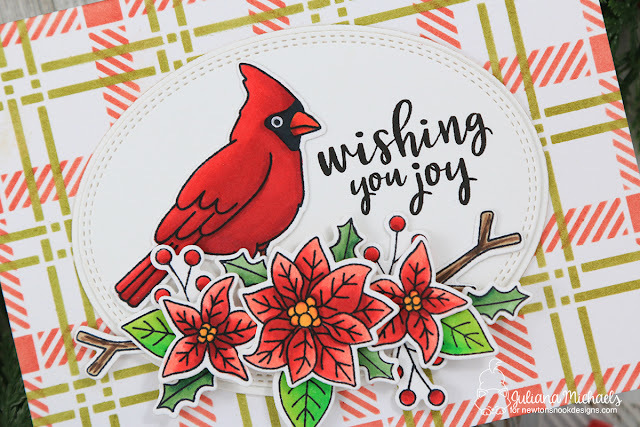 After you check out the inspiration I have to share with you today, continue reading to get all the details on today's blog hop and giveaway. 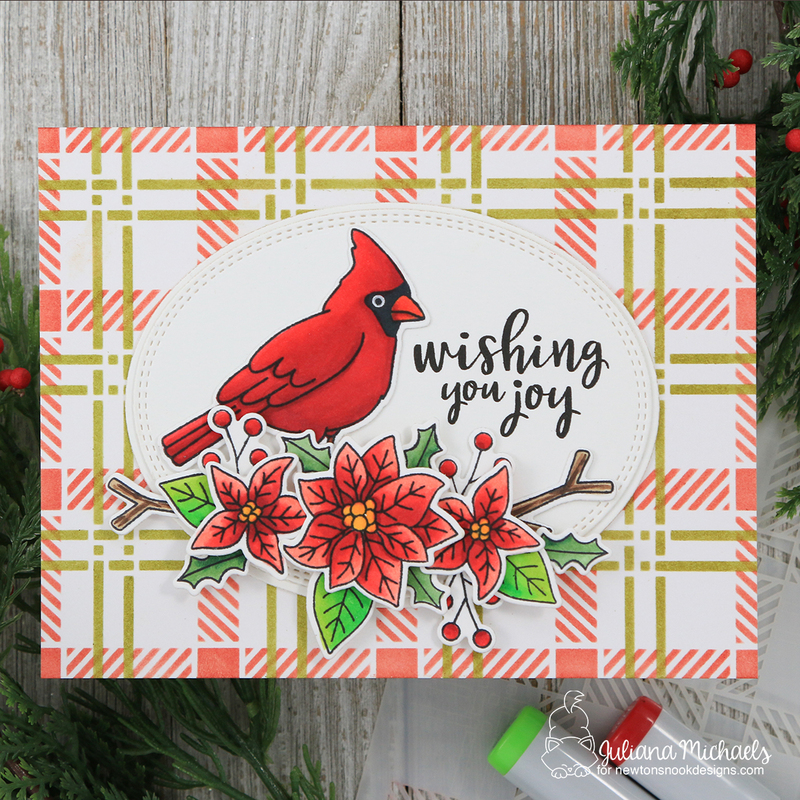 First up, I'm sharing a card using the new Winter Birds Stamp Set. Actually this card uses, both new sets. I couldn't resist combining them! I first stamped the images and then colored them with Copic Markers. Then, I die cut them using the coordinating dies. Next, came the part of piecing and layering all the parts to create the design. Once I got them how I wanted them, I placed a piece of Therm O Web Purple Tape over them to hold them in place. Then I flipped them over and adhered double sided foam tape to the back of the flowers and some of the leaves to give the piece a bit of dimension. 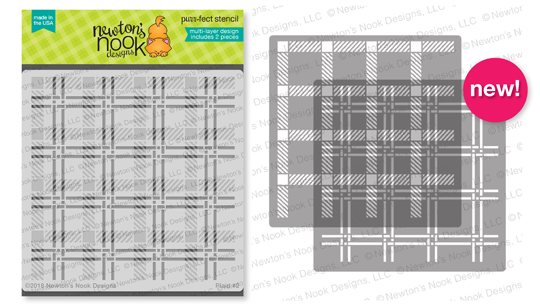 To create the background, I used the new Plaid Stencil. I love these new layering stencils and I can't wait to keep playing with them. I inked each layer using Distress Ink in Fired Red Brick and Peeled Paint. To center the stencil on the paper I started with a slightly larger than normal card front. 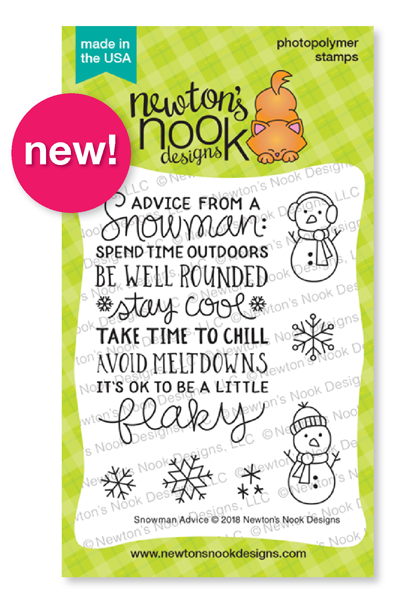 Once I had the design inked up, I trimmed it to size so the design would be centered on the card front. I love that the stencil was designed to allow you to create a larger design by simply sliding it over a little as you finish inking each section. 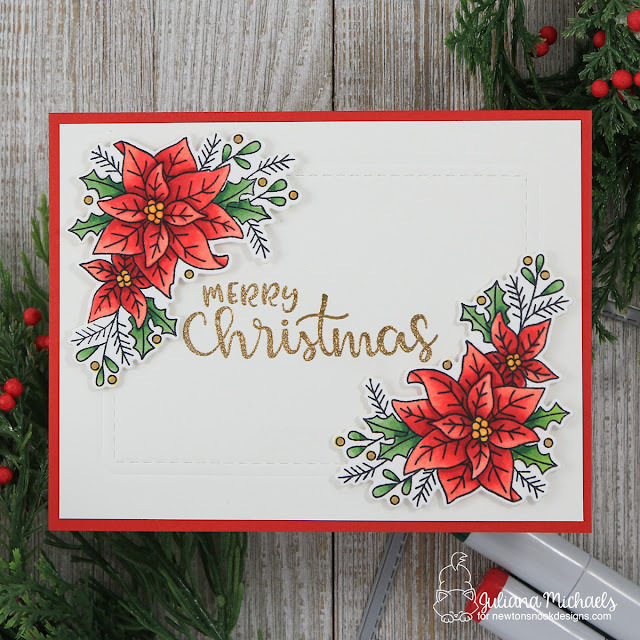 For this second card, I used the Poinsettia Blooms stamp set again and combined it with the Sentiments of the Season stamp set. 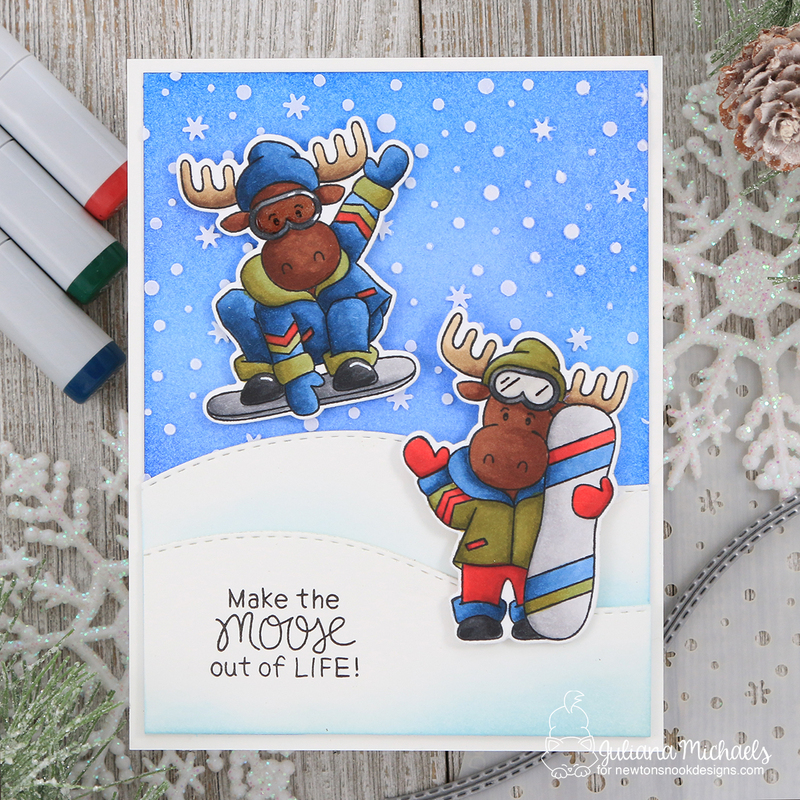 I stamped and colored the images with Copic Markers and die cut them using the coordinating dies. To add a bit of texture, I used the stitched rounded rectangle die from the Frames and Flags Die Set to emboss a frame in to the center of a piece of white cardstock trimmed to 4 x 5.25 inches. 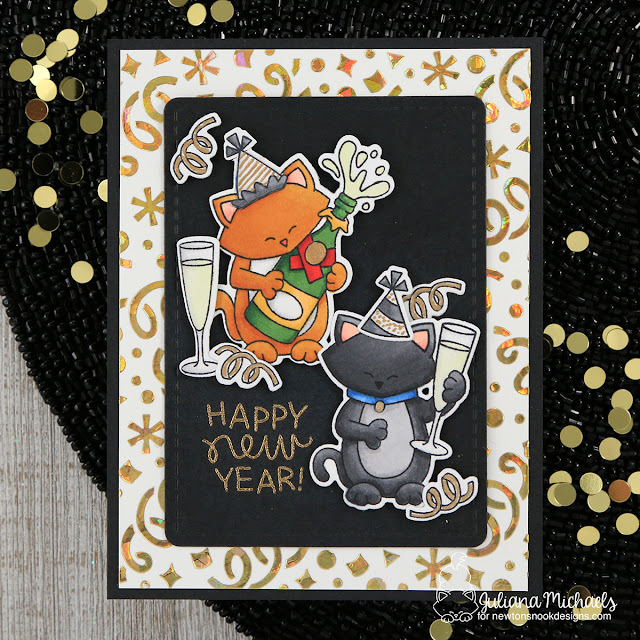 Embossing with a die is super easy, however the plates and layers you need to do it vary with each die cutting machine. I recommend referring to your machines instruction manual for details on how to do this. 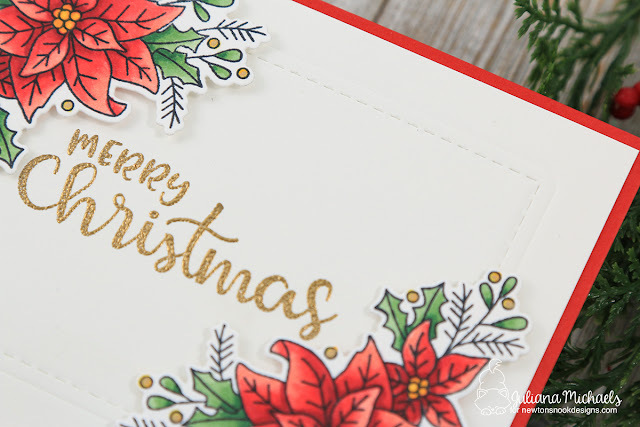 Once the embossing was complete, I stamped the sentiment in the center and embossed it with gold embossing powder. I then finished off the card by adhering the poinsettias to the corners with double sided foam adhesive. Here's a look at the Winter Birds Stamp and Die Set. So what do you think of today's release? Aren't they just gorgeous? Keep reading for the blog hop and giveaway details. 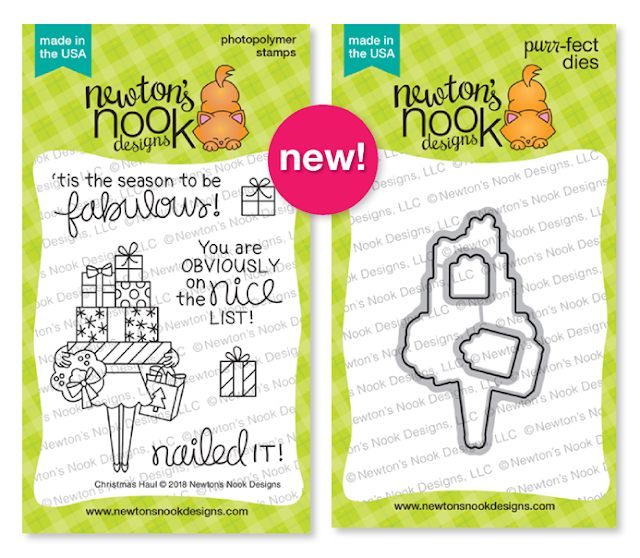 Hello and welcome to Newton's Nook Designs November Release Day 1! I'm so excited to share all of the new products with you this week as we count down the days until they are available to purchase! We will be revealing new products today through Wednesday, November 21. 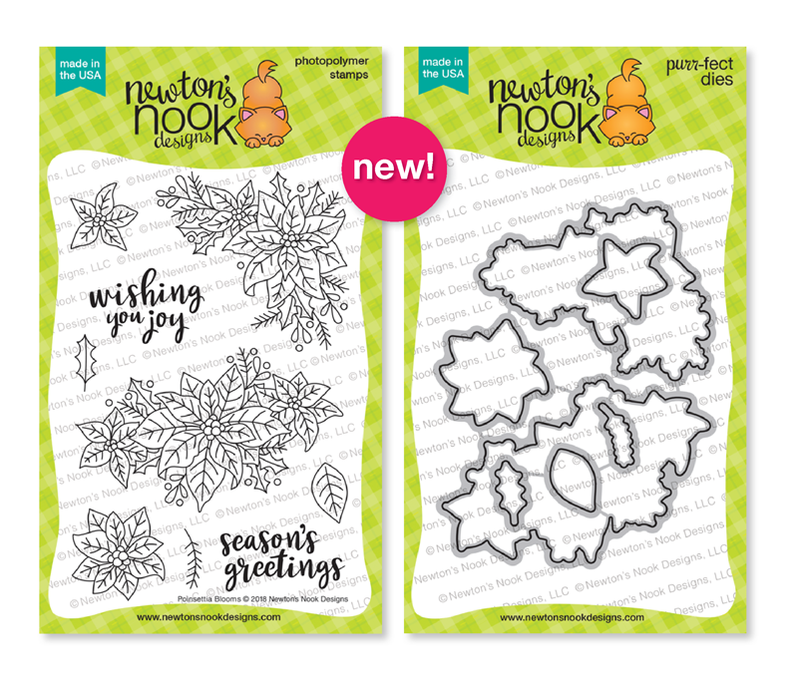 They will all be available to purchase on Friday, November 23 AND this will be just in time for Newton's Nook Designs Black Friday Sale! Now let's get started on today's new product reveal. And make sure to keep reading after the inspiration I have to share for the blog hop and giveaway details! First up we have Christmas Haul. The classy lady is back and ready to help you celebrate the holidays! 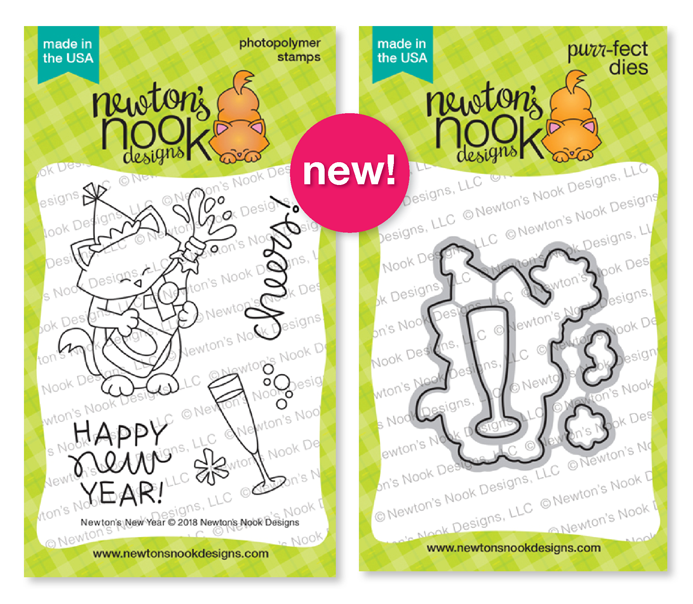 This set joins the family of similar style stamps....Classy Teachers and Holding Happiness. 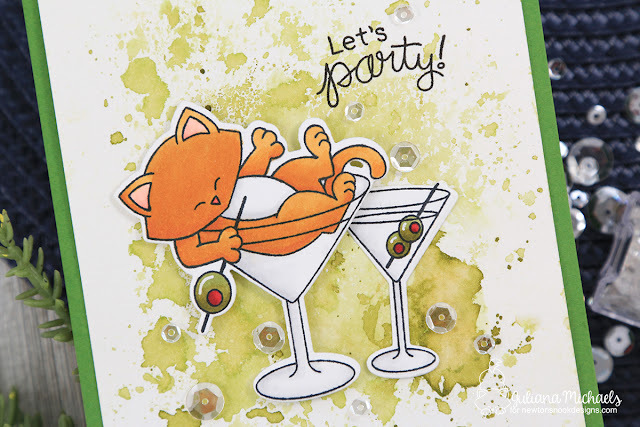 For this card, I stamped and colored the images using Copic Markers. I then die cut them using the coordinating Christmas Haul Die Set. I adhered the images with double sided foam adhesive to a panel of white cardstock cut with the scallop edged die from the Framework Die Set. This was then adhered to a piece of black plaid patterned paper. Here is a full peak at the Christmas Haul Stamp and Die Set. 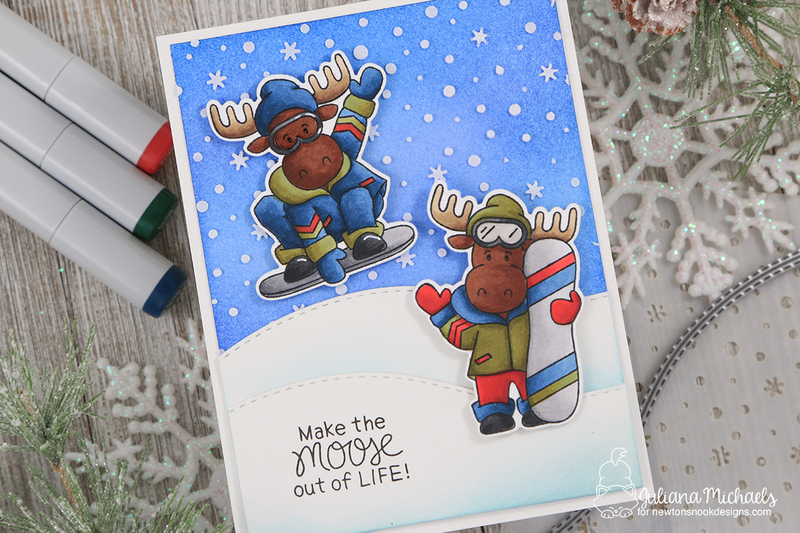 Next up we have Moose Mountain...an adorable set perfect for making the "moose" out of life! I stamped the images and colored them with Copic Markers. I then die cut them using the coordinating die set. The background was created by inking up a piece of Bristol Paper with Distress Ink in Salty Ocean and Blueprint Sketch. Once that was dry, I placed the Petite Snow Stencil on top and added a layer of Ranger Texture Paste using a palette knife. For the snowy hills, I die cut white cardstock using the hill dies from the Land Border Dies and then lightly inked the edges with Tumbled Glass Distress Ink. Here's a look at the Moose Mountain Stamp Set and coordinating die set. 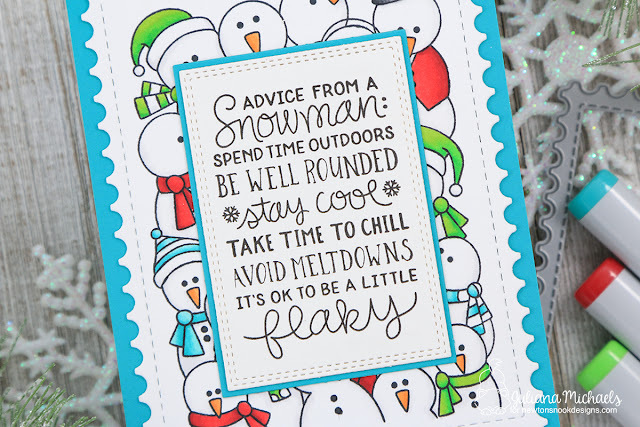 For the final card I used the new Snowman Advice stamp set and combined it with the Frozen Fellowship stamp set. 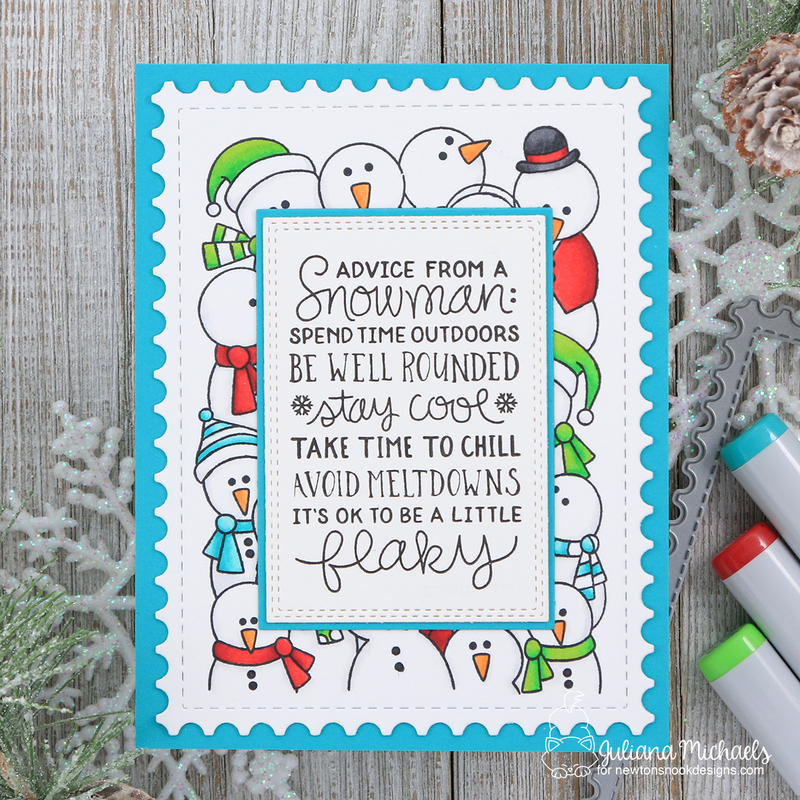 I stamped and colored the snowmen using Copic Markers. I then die cut the image using the postage edge die from the Framework Die Set. Next, I stamped the sentiment from the Snowman Advice set and die cut it using a stitched rectangle die. 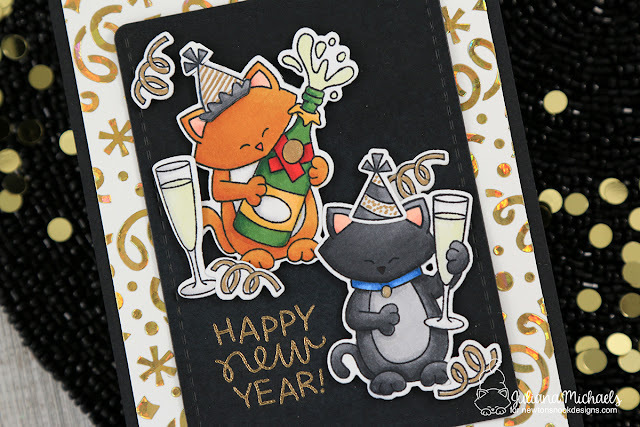 I finished off the card by layering both pieces onto teal cardstock. Here's what the Snowman Advice stamp set looks like. 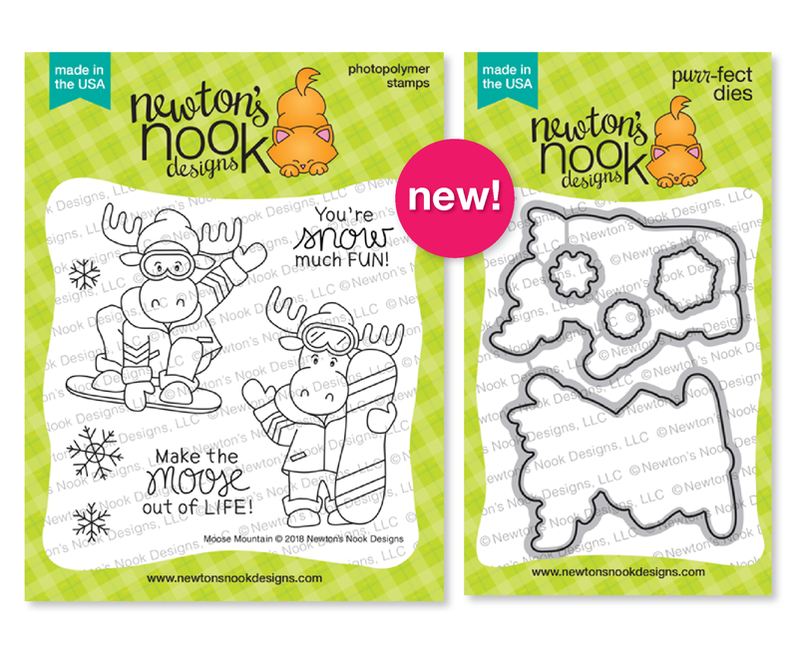 Along with these new stamp and die sets, we are also revealing 2 new stencil sets. These new stencils are a bit different than the other stencils from Newton's Nook. These are layering stencils and I have to tell you, they are going to be quickly become your new favorite stencils! 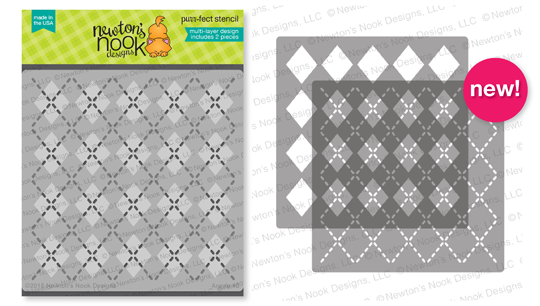 They help you easily create an argyle pattern with one set and a plaid pattern with the other. You simply apply your color to one layer then using the lines etched into the die, line up the the next layer and apply the your other color. 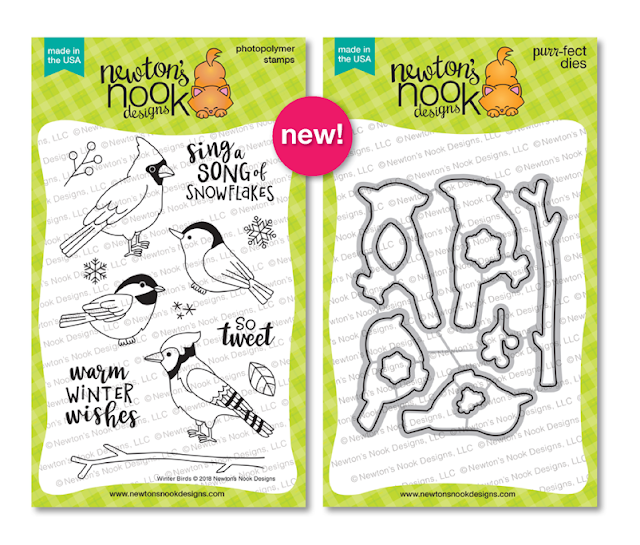 The possibilities are endless with each of these designs. I'll be sharing how I used one of them later this week and make sure to check out what the other designers have created with them. WOW, so many fun new goodies and it's only Day1! Keep reading for the blog hop and giveaway details. Hello friends and welcome! 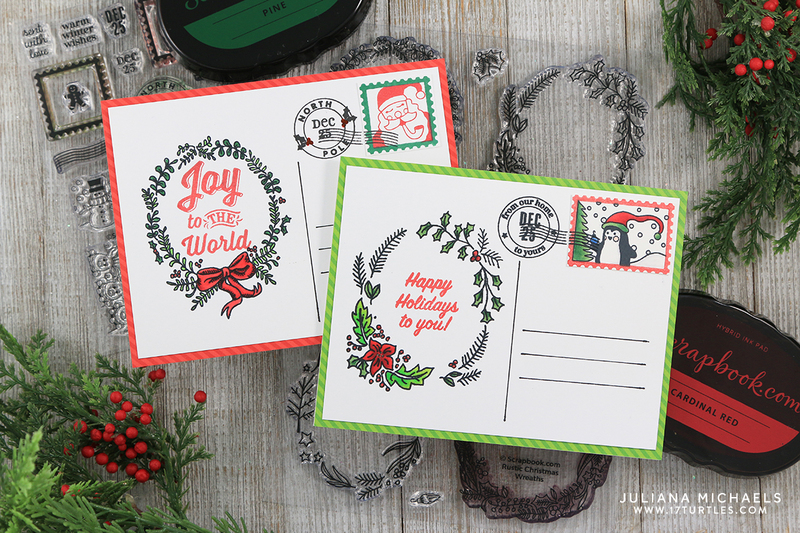 Today I'm super excited to share a set of Postcard style Christmas cards I created using the new Scrapbook.com Exclusive Stamp Set called Merry Mail. I was thrilled when Scrapbook.com contacted me and asked me to create and share some cards using this new stamp set. 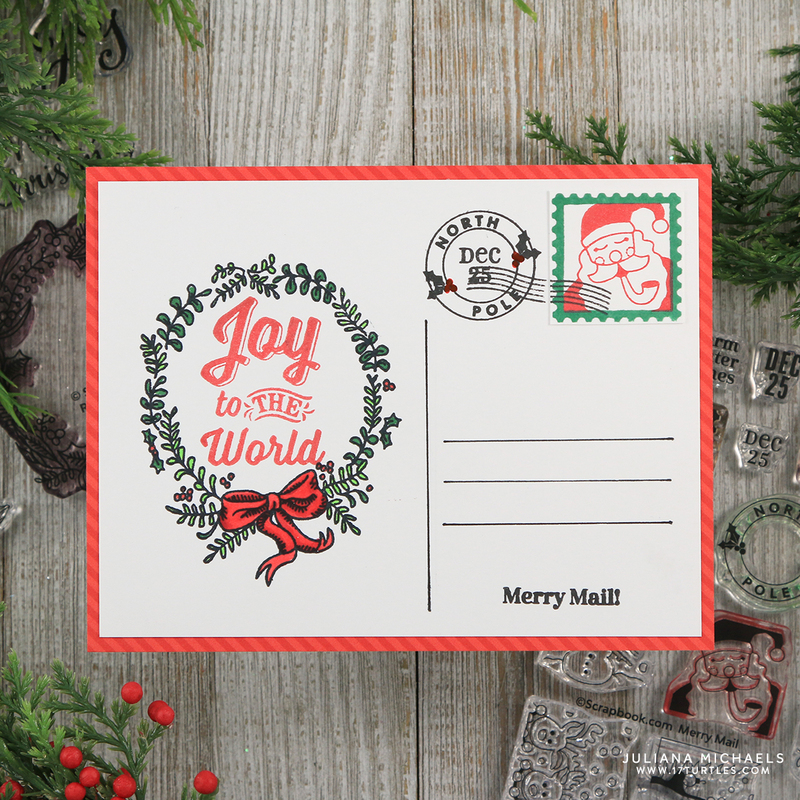 As you will notice, the new Merry Mail Stamp Set is full of whimsical designs perfect for creating your own special delivery to your friends and family this holiday season! 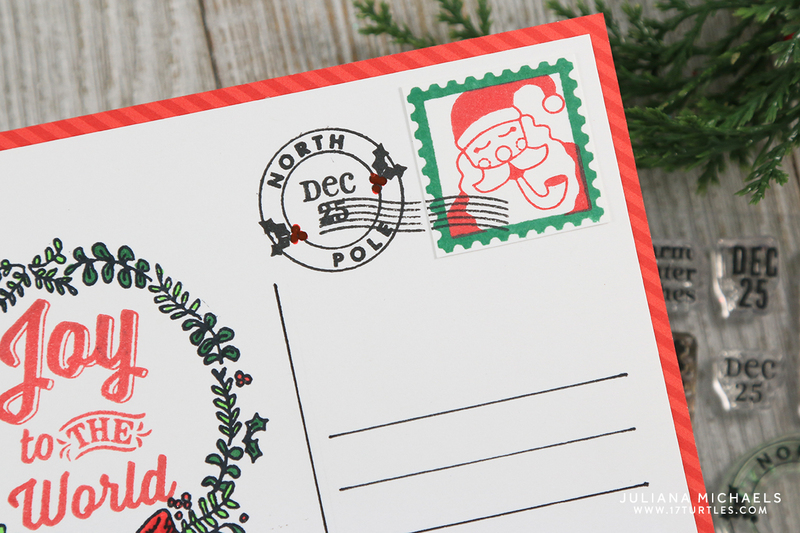 When I saw the stamps, I was immediately inspired to create a postcard style design. I began by taking a Neenah Solar White Card Front and trimmed it down to 4 x 5.25 inches. I then used a ruler and black pen to draw the center line and address lines on the card. 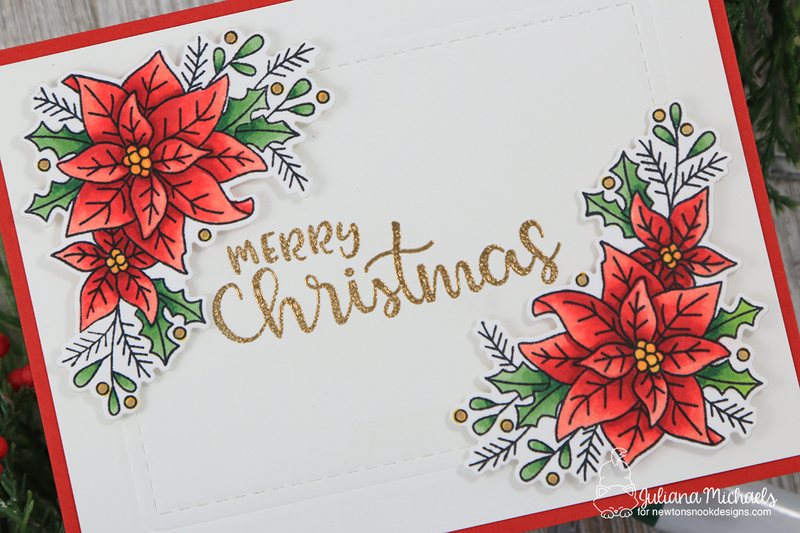 To decorate this first postcard, I used the Rustic Wreath Stamp Set on the left hand side and colored it with Copic Markers. For the sentiment inside the wreath, I used the Holly Jolly Sentiment Stamp Set. I stamped this using the new Scrapbook.com Premium Hybrid Inks in Cardinal Red. 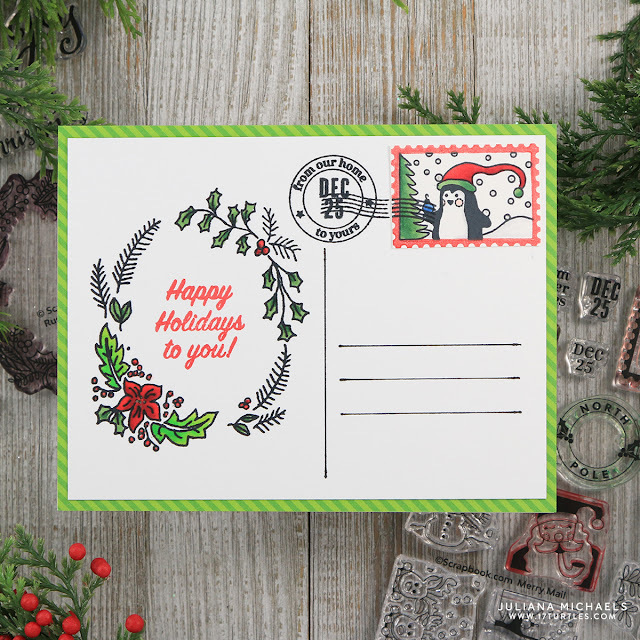 To finish off the card, I created a stamp and postmark using the Merry Mail Stamp Set. I stamped the rest of these images using Scrapbook.com's Premium Hybrid Inks in Pine and Black. 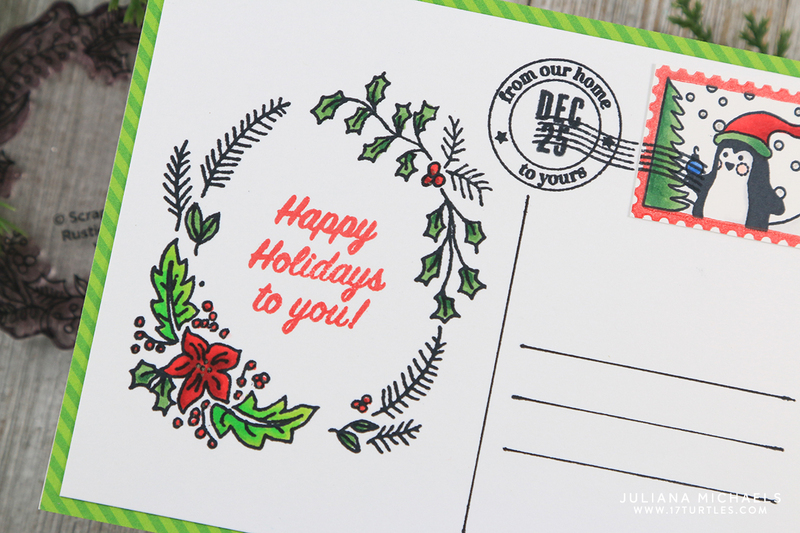 I then layered the white card front onto a piece of red striped patterned paper to mimic the look of a postcard. On this second card, I used the same process as I did on the first card. I first stamped the images and then colored them with Copic markers. Isn't that little penguin just adorable?! After the coloring was finished, I added the postmark. I love that you have a mix of options to create your own design. There are so many design possibilities with the Merry Mail Stamp Set! 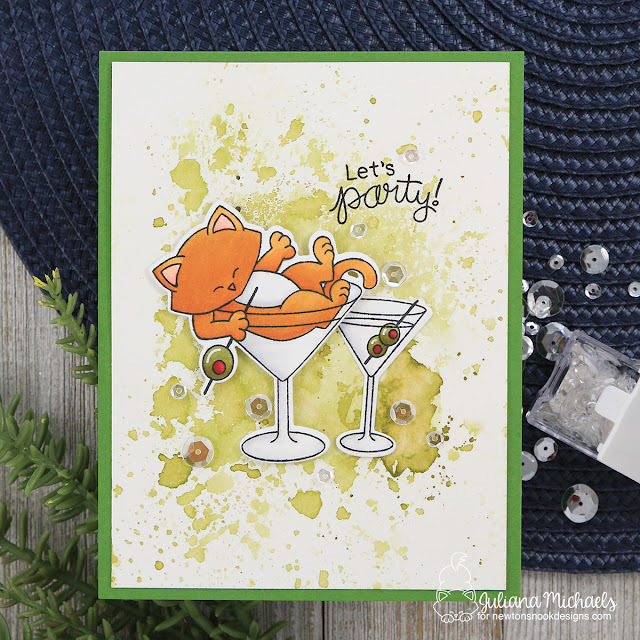 To complete the card, I layered it onto a piece of green striped patterned paper. 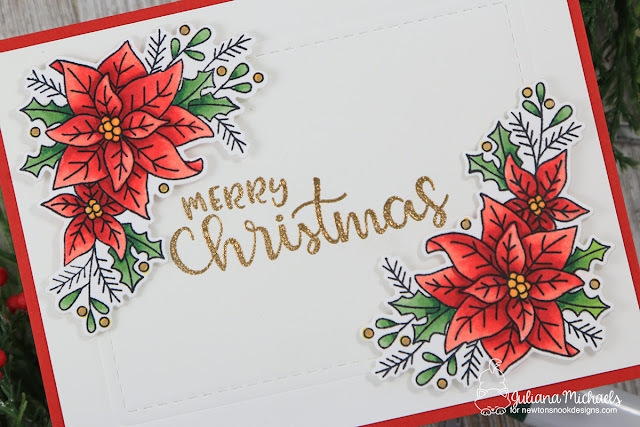 I hope you enjoyed these Merry Mail Christmas Postcards that I shared with you today using some of the new stamp sets by Scrapbook.com. How would you use this stamp set? Here are the supplies I used to create this card. 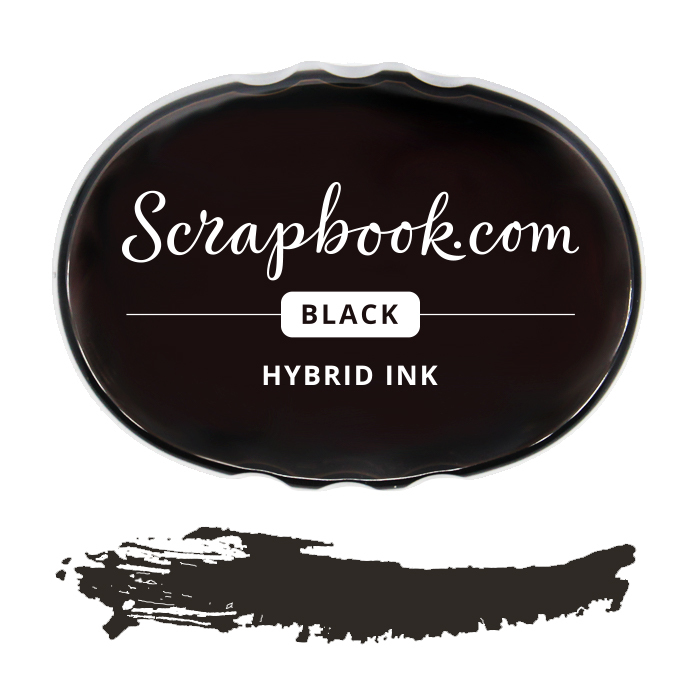 Affiliate links have been used to Scrapbook.com. Thank you for your support!